Nearly 50 million people worldwide have Alzheimer's disease or another form of dementia. These irreversible brain disorders slowly cause memory loss and destroy thinking skills, eventually to such an extent that self-care becomes very difficult or impossible. While no cure currently exists, certain medications can delay the progression of symptoms for several years, extending the quality of life for patients. However, in order for these medications to be effective, the disease must be diagnosed at an early stage, before the symptoms of cognitive decline become apparent. Current research suggests that the brain damage associated with Alzheimer's likely starts a decade or more prior to symptom onset. Reliable screening tools for predicting individuals at risk of developing Alzheimer's disease are urgently needed. Recently, a team from the U.S. Department of Energy's (DOE) Brookhaven National Laboratory, Columbia University Medical Center, Stony Brook University, and Ilsan Hospital in South Korea has shown that a combination of two different modes of MRI, computer-based image analysis, and image classification using machine learning models may be a promising approach to accurately predicting Alzheimer's risk. 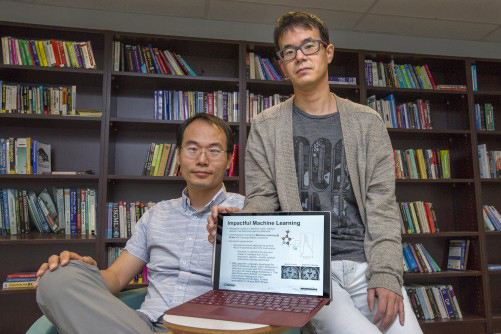 "Such multimodal imaging analysis can enhance predictive power by identifying key diagnostic markers of the disease," says team member Shinjae Yoo, a computational scientist in Brookhaven Lab's Computational Science Initiative. Previous MRI studies in which scientists analyzed the shape and dimensions (morphometry) of the brain have revealed that Alzheimer's disease involves characteristic changes in the brain's anatomy. For example, thinning of the cortex and shrinking of the hippocampus—both brain structures that play an important role in memory—are diagnostic markers of Alzheimer's. Although structural MRI is routinely used as part of the clinical assessment when someone is suspected of having the disease, it lacks the level of accuracy and generalizability across patient populations to stand by itself as a reliable predictive tool. Using diffusion MRI, scientists have found abnormalities in the white matter—a type of brain tissue—in patients with Alzheimer's disease. White matter, which lies beneath the cortex, consists of millions of bundled nerve fibers (axons) that connect neurons in different gray matter regions of the brain—a structured network that runs like tracts of communication cables across the brain. The white color comes from the fatty layer of electrical insulation (myelin) that coats the axons, allowing them to more quickly send nerve impulses across the brain. Gray matter has relatively few myelinated axons, so it takes on the color of the nerve cell bodies it is composed of. The majority of Alzheimer's research to date has focused on gray matter degeneration, but because of recent advances in computational modeling tools, scientists are turning their attention toward white matter. 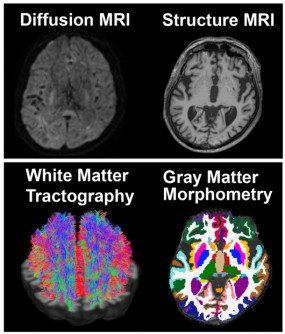 For example, improvements in algorithms for tractography—a computational method to reconstruct white matter tracts from biophysical models of nerve fiber orientations—are enabling more accurate estimations of the microstructure of white matter. Preliminary research suggests that the integrity of white matter declines in those at risk for Alzheimer's disease. On MRI scans, the degeneration appears as bright white spots called hyperintensities. However, scientists are unsure to what extent the white matter "structural connectome"—the brain's wiring system, or the unique pattern of connections between the billions of neurons in the brain—carries additional information for Alzheimer's risk beyond what is shown by morphometry analysis based on structural MRI. Yoo and his team set out to address this question, using structural and diffusion MRI images that were collected from a group of more than 200 elderly patients who visited a dementia clinic at Ilsan Hospital. Neurologists had already diagnosed these patients with Alzheimer's disease, mild cognitive impairment (the stage between dementia and the expected cognitive decline from normal aging), or subjective cognitive decline (thought to be the earliest sign of dementia, in which patients report a decline in memory or other cognitive functions but perform normally on standard screening tests). To process and analyze the raw images, the team members designed a rigorous pipeline consisting of several existing algorithms. Next, they applied machine learning to train image-derived classification models on the brain "phenotypes" resulting from their analysis—estimations of brain shapes and volumes (morphometric data) and of white matter structural connectivity (tractography data) in patients from each diagnostic category. They then used the models to make predictions of diagnosis. "In one study using data from a dementia clinic, we achieved up to 98% accuracy in detecting Alzheimer's disease and 84% accuracy in predicting mild cognitive impairment, the precursor to Alzheimer's," says team member Jiook Cha, a research scientist and assistant professor of neurobiology in the department of psychiatry at Columbia University Medical Center. "The accuracy of our machine learning models trained on brain connectome estimates surpassed that of existing imaging-based markers used in clinical settings (eg, white matter hyperintensities) by 10% and 29%, respectively. Using independent data from the Alzheimer's Disease Neuroimaging Initiative, we replicated these results." By comparing the performance of their different machine learning models, the team members determined that the structural connectome may be a clinically useful imaging marker for Alzheimer's disease. "The model trained on both morphometric and connectome data more accurately classified Alzheimer's disease and mild cognitive impairment than the model trained on morphometric data alone," Yoo explains. "In addition, the connectome model classified mild cognitive impairment and subjective cognitive decline as accurately as the combined model—unlike the morphometry model, which did not classify accurately." These results suggest that diffusion MRI could be a valuable tool in the early detection of Alzheimer's disease. Neuroscientists believe that mild cognitive impairment and subjective cognitive decline are precursors to Alzheimer's, so abnormal changes in white matter that are detected in these preclinical stages could indicate patients who are at an increased risk of eventually developing Alzheimer's. The ability to identify such microscopic changes years before more severe macroscopic changes set in could lead to better treatments and possibly even a cure. "This study strongly indicates the feasibility of using multimodal MRI—particularly diffusion MRI–based analysis of the structural connectome—to accurately predict Alzheimer's risk," Cha says.